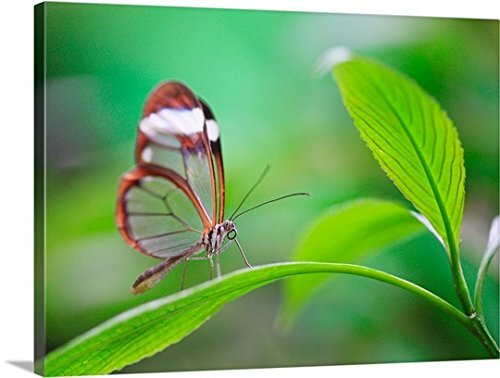 Gallery-Wrapped Canvas entitled 'Glass wing butterfly relaxing on fresh green leaf'. Multiple sizes available. Primary colors within this image include: Forest Green, White, Dark Forest Green, Lime Green. Made in the USA. Satisfaction guaranteed. Inks used are latex-based and designed to last. Canvas is designed to prevent fading. Canvases are stretched across a 1.5 inch thick wooden frame with easy-to-mount hanging hardware.